These magical sea creatures seem to fly above the bottom of the sea with their wings spread, swimming peacefully in the heavenly blue waters of the ocean at Manta Point. 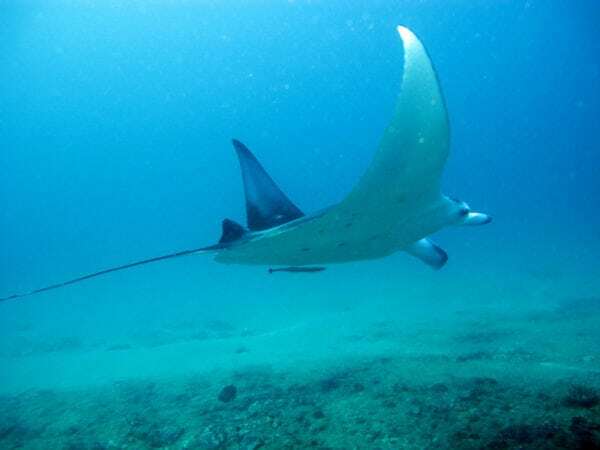 You can book a snorkelling trip to see them and we can assure you that it is an enchanting experience. The traditional fisherman’s boat will take you to several snorkelling spots around the island, starting at Manta point. The earlier you go, the more chance you have of seeing them. Before you know it, you are surrounded by these gigantic sea creatures. If you have never seen them before, you will be blown away! Mushroom Bay is a popular place in Nusa Lembongan where there are lots of accommodation, bars, and restaurants. After 3 pm, when the speedboats are done dropping of island visitors, this beautiful white sandy bay makes a perfect swimming spot where you can also go snorkelling. The sea is invitingly blue, the sand is soft and there are some bars and restaurants to get drinks. This beautiful, mostly desolate beach is one of the island’s best-kept-secrets and not to be confused with Nusa Ceningan’s secret beach! The secret beach of Nusa Lembongan is not found on the map, and therefore a true hidden gem. You can get there through a hidden entrance from Mushroom Bay, or off-the-beaten-track when you head towards Tamarind Bay (turn left at the ‘Nanuk Bungalow’, walk to the end of the paved road, and follow the small nature trail, over the hill to get there). The sand is white, the ocean is blue, there are waves during high tide and it is perfectly safe for swimming. You can also ask the locals about how to get there, they will he happy to share the secret with you. A great beach for romantic couples! These two stunning beaches provide you with breathtaking views of the ocean where waves crash on the limestone rocks. The sea is not safe for swimming but you can stroll along the shore and enjoy some drinks at the ocean-front bars while gazing at the sunset. The beach at the main village Jungut Batu is also nice for swimming. The water is crystal clear and there are some bars in the shade to enjoy drinks together with friends. This beach is located at the end of Jungut Batu, close to the mangroves. The beach is usually quiet and it offers magnificent views of the sacred Mount Agung on the mainland of Bali. A short ride up from the town of Jungut Batu awaits the mangrove forest. From here, you can hop on a hand-made raft and go on a 30-minute mangrove adventure. The ambience is utterly serene and tranquil, surrounded by nothing but nature. The friendly local will do the paddling for you, so you can simply sit back and relax. 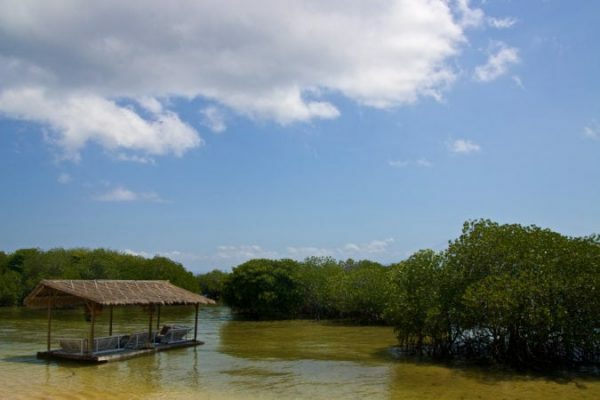 You can also combine the mangrove boat ride with a snorkelling tour. Ask the locals about it and bargain for a good price. The best way to see the whole island is by Motorbike. Hop on the bike and make a circle around the island, going up the hill to magnificent viewpoints, driving through the touristy areas as well as the local authentic Balinese villages. On the way, you can stop to swim at one or two of the many beaches or enjoy drinks at hill top bars. 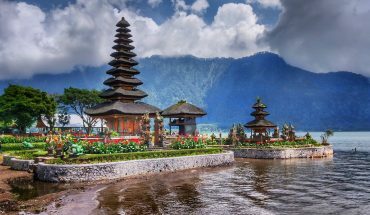 You can also visit the neighbouring island of Ceningan. The original island bridge crashed last year but it has been rebuilt, making it a safe crossing point again, even with a motorbike. From there, you can explore further. Remember to drive slowly, allowing you to enjoy the beautiful sceneries and keeping you safe at the same time. Wear some sunblock too if you don’t want to burn alive in the hot tropical sun of Bali. For those scared to drive a motorbike, you can also rent a bicycle and cruise around a bit. Seeing the whole island by bicycle is not an easy thing as it is quite hilly. 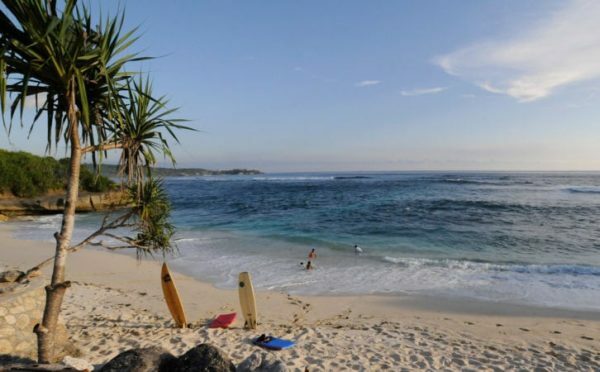 If you are into surfing, Nusa Lembongan is a true paradise! There is a great surfing scene with bars and fellow water adventurers. The high waves, far out at sea, are quite challenging and not for beginners. 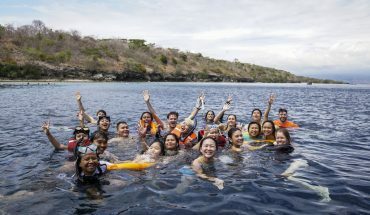 Don’t be surprised if there are dolphins swimming not too far away from you, I have seen it myself while having drinks at one of the cliff-edged bars on Nusa Ceningan; surfers in the front and a big group of dolphins swimming behind them. Amazing! 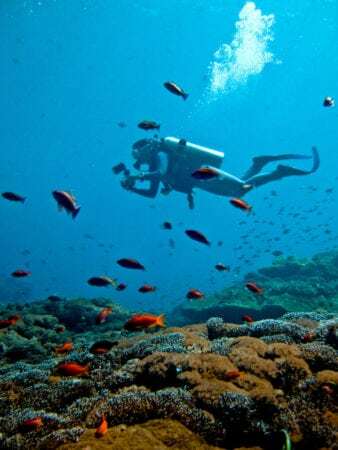 Many snorkelling and diving enthusiasts travel to Nusa Lembongan to explore the amazing underwater life. You will start the journey on a traditional boat and visit several spots around the islands Nusa Lembongan, Nusa Ceningan and Nusa Penida. Beautiful corals, colourful fish, and manta rays await. At some points, the current will gently bring you from one place to another while the boat follows. Located right by the sea, overlooking the ocean and the islands seaweed plantations sits The Deck, a charming bar and restaurant, perfect for lounging to the view of the deep orange sky with Bali’s holy Mount Agung as the backdrop. Order some cocktails and snacks and your evening can’t go wrong! Even better news is that between 5 pm and 6.30 pm, it is happy hour, giving you 25% discount on your ordered beers and cocktails. Every Sunday, you can stick around for the Sunday Sessions with international DJs playing their sets for the perfect easy and laid-back holiday vibe. A bit more high-end, at the popular Sandy Bay Beach Club, you can sip cocktails while leaning over the edge of an infinity pool, gazing at the mesmerising view ahead of you. It is also a nice place to go for dinner if you feel like splurging. 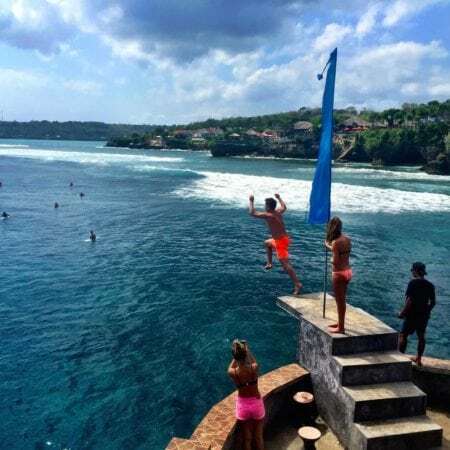 For the daredevils among us, head over to Ceningan’s Mahana Point and take a leap of faith as you jump from the cliff, 12 meters down into the deep blue sea below. Not for the faint-hearted! Right next to the cliff jumping spot sits a nice bar to have a Bintang beer (after jumping, not before!) and while enjoying your drink, you can watch the surfers ride the waves of the sea. Stick around for sunset, too! If you prefer to have everything organised for you, check out a Nusa Lembongan tour. This Balinese local eating place serves excellent local food and surprisingly, also for good burgers. Something for everyone 🙂 While enjoying the food, you get to enjoy lovely views of the seaweed plantations between Lembongan and Ceningan. Try their sate on lemongrass sticks, it is yummy! For those into healthy food and freshly made smoothies, you will love the Bali Eco Deli, located in the center of town. A great place to go for breakfast or lunch. Have a bowl of yoghurt with fresh fruits, or a homemade soup or salad, all made with organic ingredients. Not all that hungry? Try their delicious coffee with a piece of homemade cake or some cookies. Those with a sweet tooth will be glad to try out all of their homemade treats. Hai Bar and Grill is located right by the sea at Mushroom Bay and they serve both local and international cuisine. Great for a romantic oceanfront dinner with your loved one. 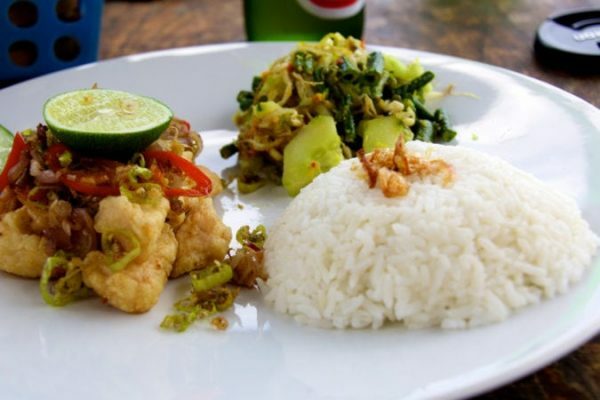 Hai Bar and Grill, Address: Mushroom Beach, Lembongan Island, Jungutbatu, Nusapenida, Klungkung Regency, Bali. Phone: (0366) 5596415. Open daily from 7 am to 11 pm. Good news! 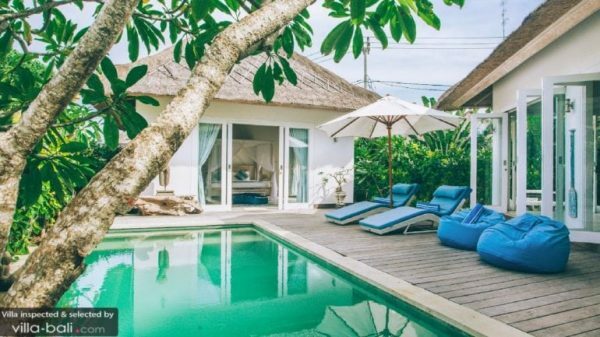 Nusa Lembongan has got some amazing private pool villas to stay at. 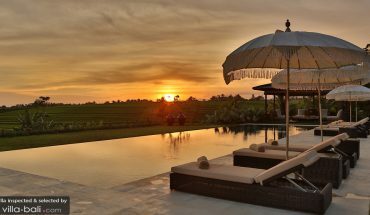 You can watch the magical sunset from your own private swimming pool if you wish, with a homemade cocktail in hand before enjoying a romantic candlelight dinner in your private, luxurious home away from home. You can be sure of a perfect night sleep in air-conditioned comfort and jump straight into the pool first thing in the morning, before enjoying coffee and breakfast prepared by the attentive villa’s staff. 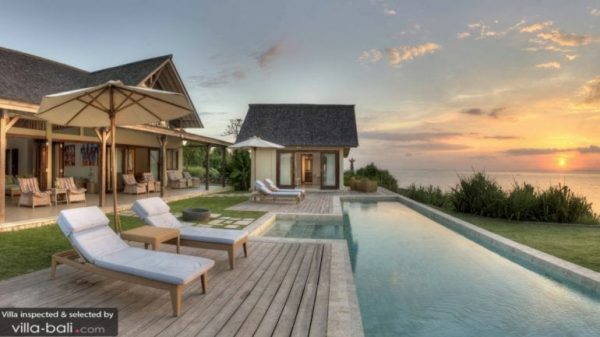 Here are some great villas to stay at on Nusa Lembongan. Check out our complete villa list here. This beauty is sitting right by the sea and it enjoys magnificent sunset views in the afternoon. You will be staying in a modern, light-filled villa, which also embraces traditional elements in its stunning architectural design. Full-length glass doors slide open to the cliff-edged garden where you can jump straight into the salt water infinity pool. Casa Del Mar is furnished with custom furniture, crafted out of teak wood and rattan. The lofty mezzanine boasts a stunning view of the ocean and limestone cliffs of the island. In the evening, you can gather here for an in-villa movie evening at the cozy TV lounge corner. Casa Del Mar houses 3 bedrooms, making it an ideal holiday hub for families. 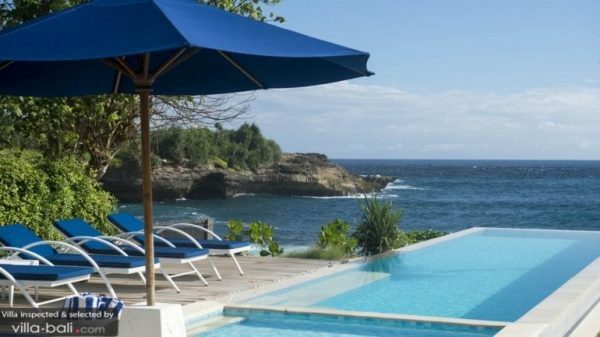 Location: Casa Del Mar is sitting on an ocean cliff on the southwest of Nusa Lembongan, near to the Sandy Bay Beach Club. A short 10-minute stroll on a nature path leads you to Dream Beach and it takes a 15-minute walk to get to Mushroom Bay. Casa Del Mar, Prices start at US$375 (low season 1 bedroom) and US$693 (high season 3 bedrooms). 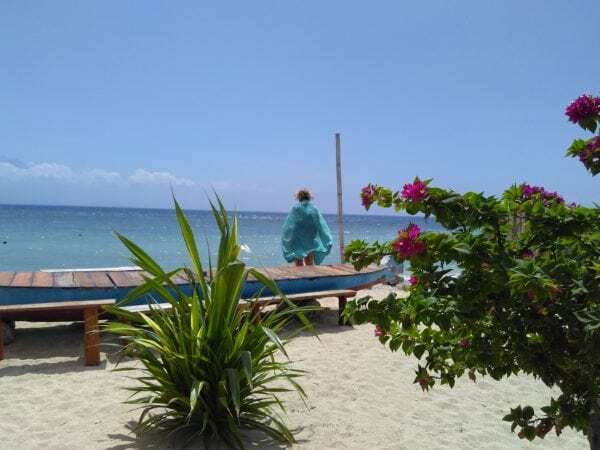 The Beach Shack is, true to its name, located right on the beach with direct access to the sandy shore and the invitingly blue water. 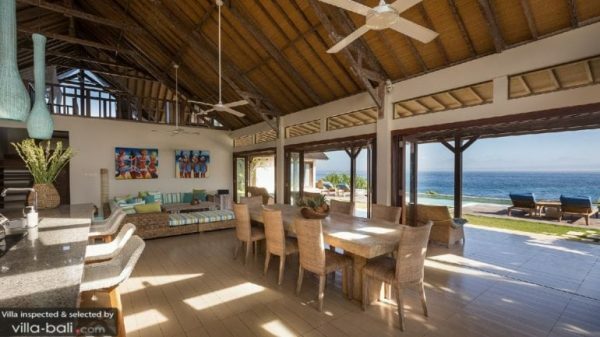 This charming 3-bedroom holiday rental features traditional alang-alang roofed pavilion and a peaceful ocean front garden with a glistening infinity pool, inviting you to jump in right on the spot. And why not? 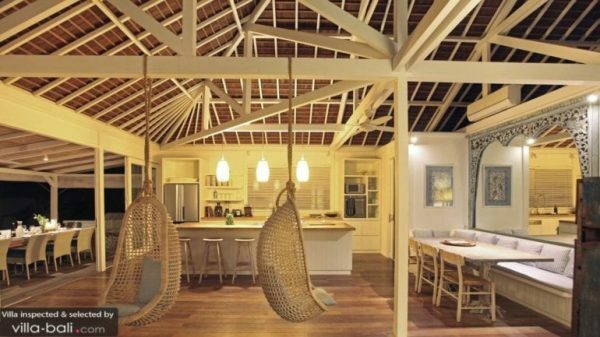 The Beach Shack features a sunset sitting corner overlooking the ocean and the interior design of the living room mixes modern and traditional seamlessly. A wonderful stay on the little island of Nusa Lembongan! 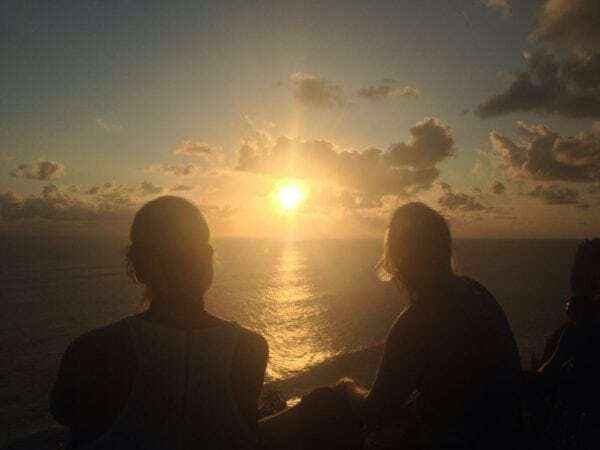 Location: The villa is located within a short walking distance of The Sandy Bar Beach Club and Glo Spa on the southwest coast of the island, also close to the Ceningan Reef Surf Break. The Beach Shack, Prices start at US$375 per night for 1 bedroom and US$693 for 3 bedrooms. A great escape from everyday life indeed, and what would be a better place than on the island of Nusa Lembongan with the pool and the ocean, just steps away from your bed? This cozy and charming 2-bedroom villa is surrounded by dense tropical plants and trees, providing guests with a whole lot of tranquility and privacy. Two spacious villa suites, fitted with romantic canopied king-size bed make wonderful places to retreat to at night and in the morning, you can sip coffee in your private sprawling garden, soaking up the gentle morning sun before plunging into the swimming pool. 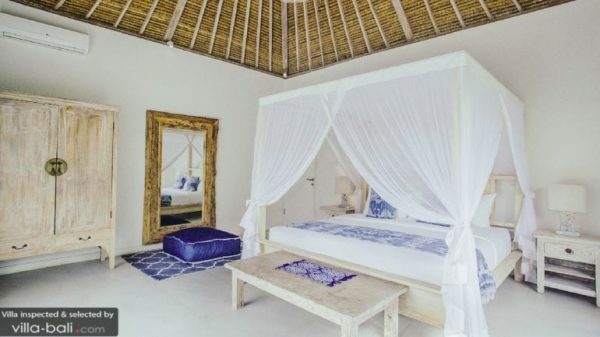 Location: Villa Escape is found just 50 meters from the beach on the southwest coast of Nusa Lembongan, within walking distance of Sandy Bay Beach Club – the place to be for sunset drinks in the afternoon. Nusa Lembongan is located just off of the southeast coast of Bali. Speedboats leave from the Benoa Harbor in Sanur from early morning until around 4 pm and it takes around 30-40 minutes to make the crossing. A return ticket should cost around Rp. 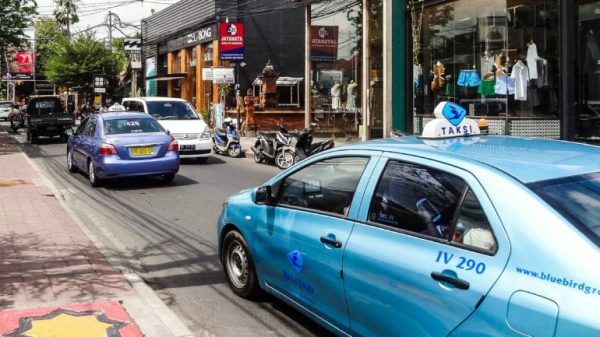 350.000, includes a pick-up from your private villa in Sanur, Kuta and Seminyak. If you are staying in places further away, additional costs apply. The boat arrives either at the dock of Jungut Batu or at Mushroom Bay. 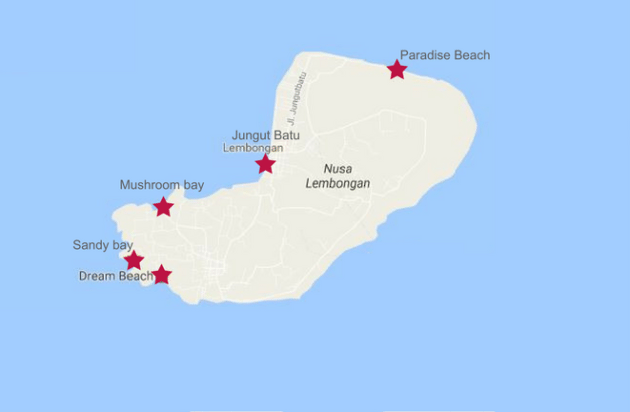 See which one of the two docks is closer to your holiday rental or check if the staff of your villa can pick you up upon arrival at beautiful and peaceful Nusa Lembongan.